About souvenir and gift shops in Ljubljana. Find this family owned souvenir shop right between the Butchers` Bridge and the Dragon Bridge. 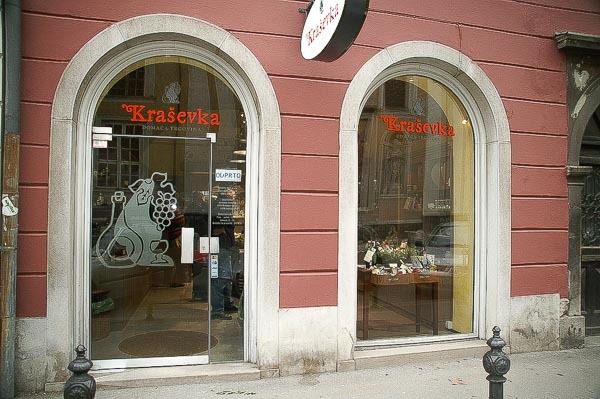 A shop where each item on sale has its own story, mainly of Slovenian ethnological, designer or gastronomical background. Home made herbal teas, pumpkin seed oil or olive oil, products of Slovenian designers are to choose from like cups, jewellery, lamps, or chocolate dragon eggs for example, which can be an attractive gift for foodies, children or sweet-tooths of any age. They also offer a selection of Slovenian wines, brandies and there is probably no other place in town where a Slovenian whiskey can be found. Free wine tasting is possible at the site, they always have something on stock. Non-alcoholic beverages are on offer to quench your thirst, as well as coffee or croissants and brownies if you need a snack. Fun fact: Owner`s uncle is the architect of the adjacent Butchers` Bridge! You can find the local pulse of the coastal countryside in the heart of Ljubljana’s old city centre. Each product is carefully selected, possesses the highest degree of quality and is of local origin. The products predominately originate from family farms, which have passed down preparation techniques from generation to generation. Try the famous Prsut with organic goat or sheep’s cheese – Refosk or Merlot wine fit perfectly with this. And don’t forget to try the best olive oil in the Mediterranean! Choose from fruity delights, brandies, honey, pumpkin oil, various herbs, teas and dried mushrooms or just buy yourself a handy souvenir. Very authentic, very traditional, very recommended! 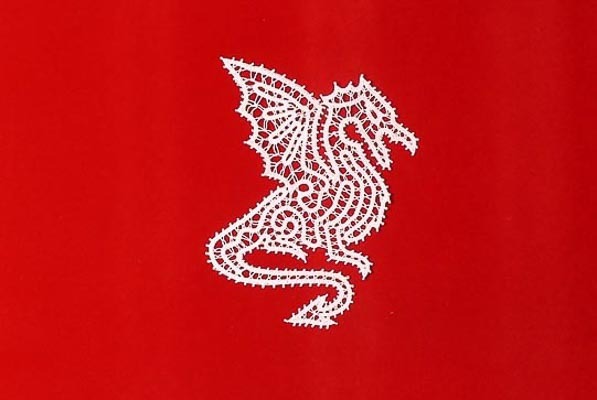 Handmade Idrian lace has been produced by local women since the 17th century in the region of Idrija, which lies a little to the west of Ljubljana. There is a shop in the centre of Ljubljana where you can see many original beautiful lace items. A beautiful, small and private gallery of the best lace works is situated in the old part of the city on Mestni trg. These products of high artistic value and old tradition have been a synonym for prestige and quality since the beginning. Get yourself a napkin or a table cover, curtains or bed linen, or even a dress or jewellery made out of lace. Of course, all the exhibits are for sale as well. “Salt is the sea that could not return to the sky”, is their motto. This shop offers products based on salt made traditionally on the coasts of Northern Mediterranean. Piran salt is supposed to be one of the finest and products out of it, too. Table salt, salt flower, bath salts, soaps with salt, salt peelings, even a salt chocolate can be found here. It is worth a look. You may get also an idea for a gift! Open until 8 pm, Saturdays up to 4 pm, Sunday till 3 pm. Zebra Gre Na Luno is a bookshop and store of the Institute for Deaf and Hard of Hearing Children Ljubljana. They sell the products crafted by their children, pupils and students. These are simple and unique objects that arise during the play in the kindergarten, at the time of artistic creation in elementary school and during practical training at their high school. The products are also thematically connected with Ljubljana and can be a great souvenir! Please find more about sustainable businesses and practices in Ljubljana HERE. Slovenia has a rich and very diverse history of handicrafts, originating from various traditions, beliefs, ways of living, habits and customs. Items produced manually in a traditional way are unique and are often the most appreciated. If you do not know what “panjska koncnica” is, why witches are good or how honey liqueur tastes like, visit Galerija Rustika. Besides traditionally painted chests, books about the city, wines and national take-away goodies, many wooden and clay artefacts can be yours to buy. You can find Galerija Rustika shop in front of Tourist Information Center by the Triple Bridge. 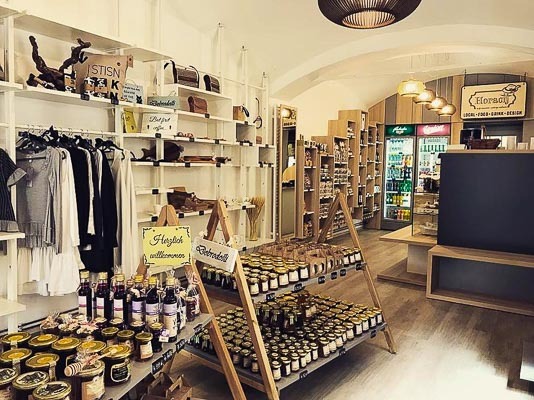 Located on the road side of the Ljubljana market, Dom shop has much to offer. 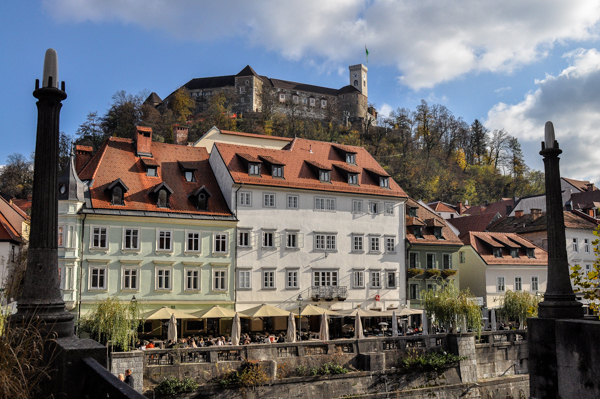 It houses a nice and extensive collection of souvenirs with Ljubljana and Slovenian motives. The collection is enriched by traditional Slovenian handicraft, different sculptures and pottery, thus it is also a place to buy a present for any occasion. Prices are reasonable. 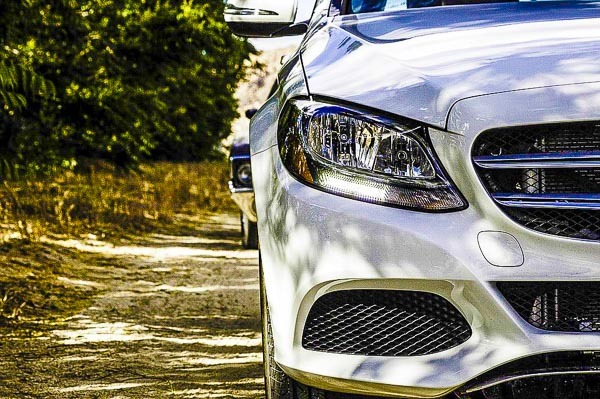 It is open Monday – Friday from 8 am till :7 pm and on Saturdays till 3 pm. This thrift shop is run by the homeless. The basic idea of the project is to sell excessive, used things that are donated by their supporters. They are sold at low prices and the earnings are appointed to the integration and employment of homeless people and people from related target groups. 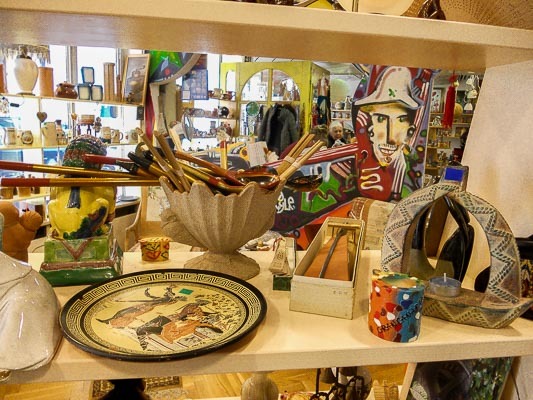 It is worth taking a peek in this shop as the items sold here are also witnesses of the past….. books, travel souvenirs, clothes, glass, pottery, even cassette tapes with old Slovenian and Yugoslavian music etc. You can find yourself a souvenir here and help the project survive. The first and only true concept store in Ljubljana. In Flat you can browse through the selection of innovative furniture and accessories for home or the office, pick up a gourmet chocolate, a stylish T-shirt or even a top design bicycle. The young and creative owners are doing a great job in selecting unique, modern and humorous products and displaying them in a gallery-like environment. Flat is also a great place for finding the perfect gift idea for a birthday, a wedding or when invited to dinner by friends or family.